Israeli air strikes on Friday killed six Palestinians, medical sources said, as the death toll of Palestinians killed since Tuesday reached 95 people. Five Palestinians, including a woman and seven-year-old child, died when Israeli strike hit the home of an Islamic Jihad fighter in Rafah in southern Gaza, wounding 15 other people, Gaza emergency services spokesman Ashraf al-Qudra said. 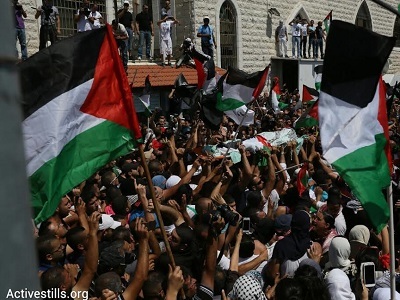 According to Qudra, around 95 Gazans have been killed since Israel launched Operation Protective Edge early on Tuesday. Since the start of the operation, Gaza fighters have fired 407 mortars and rockets that struck Israel, while another 118 rockets were intercepted by the Iron Dome missile defence system, an army spokeswoman said Friday. It is the deadliest violence since a November 2012 conflict in Gaza, and fighters have been firing rockets at Jerusalem and Tel Aviv for the first time since then. No Israelis have been killed from the rocket fire. Israel has also authorised the call-up of 40,000 reservist troops, as it threatens a ground operation to stamp out rocket fire from Gaza militants. Meanwhile, a rocket fired from Gaza hit a petrol station in southern Israel on Friday, causing a huge explosion and injuring three people, the Israeli army and medics said. “A barrage of rockets was fired at Ashdod, one of which hit a gas station causing massive damage,” a statement from the army said. Medics said three people had been taken to hospital, including one who was very seriously hurt. “Three people were injured, one very seriously,” emergency services spokesman Eli Bin told public radio of the incident, which occurred in the southern port city of Ashdod, 28 kilometres (17 miles) north of Gaza. A large fire was raging at the site, with emergency teams trying to control the blaze, medics said. Palestinian Authority President Mahmoud Abbas on Friday warned against an imminent Israeli land operation against the Gaza Strip. Abbas said the Israeli government had already approved a land operation against the coastal enclave and that the operation can start within few hours. He said the Israeli army had asked Palestinians living in Gaza’s border area to leave their homes and head inside the strip. “The Israelis just want to get us out of our land and our country,” Abbas said. “We will not leave, but will continue to resist in a civilized manner, even as we do not have arms,” he added. Analysts said that in the event of a ground offensive, Hamas would aim to inflict heavy casualties on Israeli troops, who would likely come under fire from anti-tank missiles and explosive devices. Hamas fighters would also be seeking to capture Israeli soldiers to use as leverage. With the violence growing worse, US President Barack Obama in a phone call to Israeli Prime Minister Benjamin Netanyahu said his government was willing to broker a ceasefire. Appeals for an immediate truce also came from UN chief Ban Ki-moon at an emergency meeting Thursday of the Security Council, saying a ceasefire was “more urgent than ever”. Russian President Vladimir Putin issued a similar plea in a phone call to Netanyahu, urging an immediate end to the bloodshed and expressing concern over civilian casualties. But Israel appeared bent on dealing a fatal blow to Hamas, with Netanyahu reportedly saying talk of a ceasefire was “not even on the agenda”. Israeli air strikes killed more than 30 Palestinians on Thursday alone, many of them women and children. Senior Hamas member and the movement’s former Gaza Prime Minister Ismail Haniya said that fighters will continue to fight back. “The enemy (Israel) is the one that started this aggression and it must stop, because we are (simply) defending ourselves,” Haniya said in a statement early Friday.